Lower back pain has multiple causes and contributing factors. Some causes may be due to personal lifestyle choices or habits, such as poor posture or poor self-care. Other causes may be out of your control, such as chronic genetic problems, previous injuries, or environmental factors like working conditions or strenuous daily tasks. Whatever the cause, chronic lower back pain will reduce your quality of life. At Carlson Chiropractic, we know that understanding the root cause of physical pain is a vital part of relieving it. So, in today’s blog, we will look into the physical causes of lower back pain and how it can be helped. Breaking down the human spine into “basics” isn’t easy. Your spine, along with the rest of your musculoskeletal system, is extremely complex. Just the spine itself is a complicated structure of bones, tendons, ligaments, muscles, nerves and nerve roots. All of this is woven together to provide your body with flexible support and strength. A simple way to look at the spine is to divide it into three curves: the cervical curve at the back of your neck, the outward thoracic curve of your upper back, and the inward lumbar curve of your lower back. These are the major curves that make up most of your spine. The spine itself consists of bones called vertebrae, separated by cartilage discs to give it flexibility, all surrounding the spinal canal, which contains the spinal cord, nerves, and nerve roots. What Causes Pain in Your Lower Back? When we’re talking specifically about pain in your lower back, there are a few things that could be the cause. Strains in the muscles or ligaments that are connected to the vertebrae are a common one, which can result from improper lifting or exercise, poor posture, or overstretching. Spinal discs break down through a loss of hydration. Narrowing of the spinal canal, causing pain and compression of the nerve roots. Damage caused to vertebrae, discs, muscles or ligaments as a result of trauma or impact. A few less common causes also include tumors, autoimmune diseases, and severe infections. Ignoring or just living with lower back pain is likely to make your problems worse. These are just a few examples of common causes. 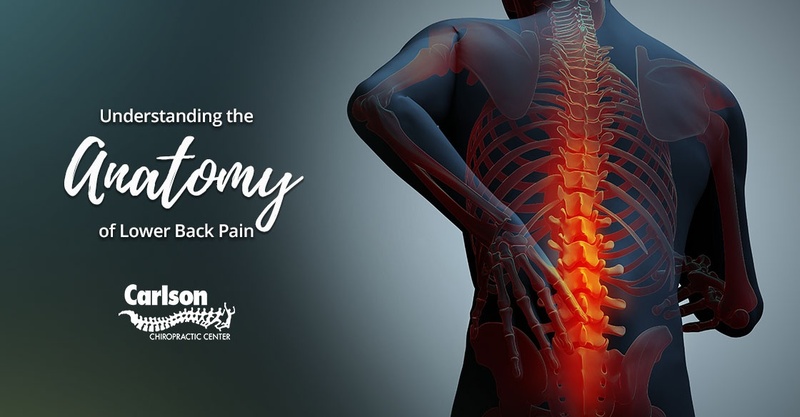 If spinal discs, vertebrae or connective tissue are damaged or degenerate, then the rest of your spine is going to suffer. Every person’s spine is different, but the professionals at Carlson Chiropractic can get to the real root of your problem. No matter the cause of the back pain you’re suffering, the end result is always the same — persistent back pain that has a major impact on your daily life. Whether it’s your lifestyle, general health or just where you work that’s causing you pain, you will want the problem fixed. We can provide you with treatment and rehabilitation, along with general advice and guidance, to relieve persistent physical pain. Talk to Carlson Chiropractic about your unique situation today. 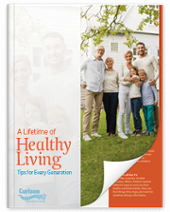 For a wealth of additional information about healthy living at all stages of life, check out our free guide, A Lifetime of Healthy Living Tips for Every Generation!